Join us on March 27 for the opening of our Visible Storage Gallery. 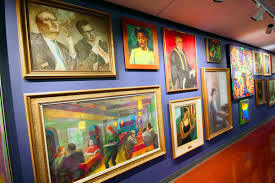 Located on the fourth floor of the McLennan Library Building, on the way into the Rare Books & Archives Reading Room, this space now includes dozens of artworks from McGill University’s Visual Arts Collection, hung salon style in an eye-catching display. Inspired by the growing trend of “Visible Storage” spaces across museums worldwide, the gallery makes available highlights from the collection that would otherwise be in storage or on view in less accessible spaces. These highlights include works from Group of Seven members Arthur Lismer and Edwin Holgate, as well as a mesmerizing work by Anishinaabe artist Norval Morrisseau. Together, the works on view represent a cross-section of our holdings in Canadian, Indigenous, and international art, both historical and contemporary, shown together here for the first time! Event organized in partnership with the Friends of the Library.